Well as you know I was on Sertraline (Lustral/Zoloft) for 7 years and weaned myself off about 3 or 4 years ago. I have to say that initially it was quite helpful. When I started taking it my sleep pattern was completely turned round, my sleep quality was appalling and my IBS was abyssmal, panic attacks were constant and off the scale BUT once it had all quietened down…after about 3 months the effets of the Lustral really kicked in. For me they were very subtle and some of them only really became apparent once I had stopped taking it. I never felt sedated but I felt ‘calm’…and not in a good way. Looking back I lost all sense of purpose and drive. I seemed focused but I wasnt. Coming off wasnt that hard (mega slowly…4 times slower than recommended by GP)apart from last few weeks when I was very, very crabby but then I suddenly realised that all my senses were becoming more acute again. Later I found/felt I had lost the ability to cope with every day ups & downs on my own ….in the sense that the paniccs returned and it was a real struggle to cope without going back on the drugs…but I did. That’s really interesting thanks Cusp. Was that a low dose or full on anti-depressant dose I wonder? I used SSRi’s (Prozac for me) in the past with depression though it didn’t do much with my last (biggie) bout of depression but since reading Dr Cheney’s theories about SSRI’s it does make me a little cautious. Certainly long term. I also had a month on amitriptyline full on depression dose back in uni and it was awful. Low dose is such a differewnt experience for me. My depression drug of choice which really helped was Venlaflaxine – horrible to withdraw from but benefitted me greatly in that last big bad depression which ended 2001. Interesting to know if Cheney and others suspect the ‘bad’ anti-depressants are still bad in low doses. I agree there are lots of options but “lack of evidence” holds so much back GP and NHS wise. I certainly can’t agree with your doc saying it’s all there is. Did you manage to find an alternative to amitripyline ? Having worked wonders for me for the past 8 months amitripyline is no longer working for me ..I have raised the dose to 60mg and am unable to tolerate more due to side effects but unfortunitly it seems to have lost its effectiveness..I need to look into alternatives or a combination treatment for my migraines and neuropathy and wonder if you managed to find an alternative that worked for you? 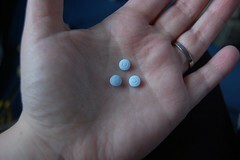 I have been taking 10mg of amitriptyline, along with 50 mg Tramadol at night for pain associated with Sjogren’s Syndrome. I just read in People’s Pharmacy column that amitryptilene is no recommended for those over 65. (I am 67.) it can contribute to confusion, memory problems and cognitive impairment, all things I think I have to some degree. Amitriptyline is listed on Beer’s List to be avoided at 65+. Any ideas what would be a good substitute for it in my case? I wonder how many of us are unwittingly experiencing these side effects without realizing it? I just assumed I was getting old…I am, but I hate to needlessly rush it! !